Is this Kentucky city the center of the universe? Not quite, but it's close enough. LOUISVILLE, Ky. — The most important economic sector in Louisville is one you may never have heard of: logistics. What is logistics? It started out simply as shipping when United Parcel Service opened a hub at the Louisville International Airport in 1980, and then made Louisville the site of its worldwide air hub in 2002. But as other companies relocated to the area to take advantage of UPS's distribution network, the sector has branched out to include a wide range of industries that provide services or products — and want to deliver them fast. "What UPS did was brilliant, and we've benefitted from their scouting," says Bob Marino, CEO of the e-commerce company CafePress, which moved its headquarters from Silicon Valley to Louisville in 2012. 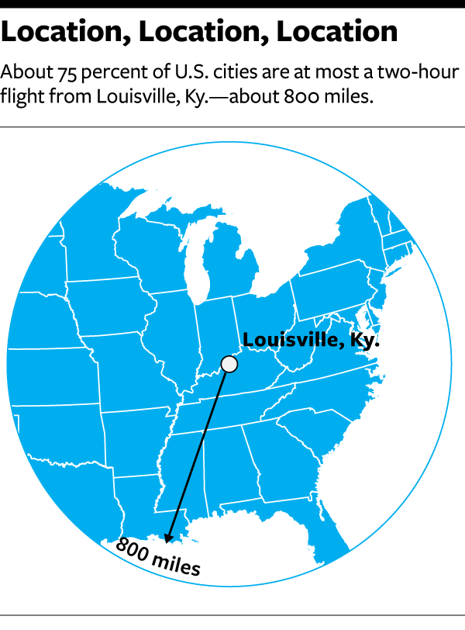 In its search for a worldside hub, UPS determined that two-thirds of U.S. cities were less than 24 hours from Louisville by ground, and three-fourths of domestic cities could be reached within a two-hour flight. It didn't hurt that Louisville had a good but not terribly busy airport, and few regulations regarding noise that would impact overnight flights. And the local workforce was relatively cheap, with plenty of college students willing to take on part-time or third-shift work. Now UPS employs more than 20,000 workers in Louisville and has invested $2 billion in two expansions of the airport and its facilities. The result is a massive 5.2 million-square-foot facility — and a magnet for other companies. Some of those companies are obvious — big online retailers like Amazon and Zappos (now owned by Amazon) have giant fulfillment centers in nearby Shepherdsville, and the location lets them promise next-day or two-day delivery to customers. Cheggs.com, an online textbook-rental service, keeps its inventory in a Shepherdsville warehouse as well, and can ship books to students within 24 hours. The dream of city leaders is that more companies will do what CafePress has and locate their entire operation in Louisville. Inside the company's sprawling facility on the southwest side of the city, production workers print customized t-shirts, mugs, and other items as a catwalk above them leads to several corporate offices. The company is moving its customer service operation in-house, which will bring on 50 new employees, and another 400 full-time workers are supplemented during the holiday season by as many as 700 temporary workers. The move from CafePress's old headquarters in San Mateo, Calif., has allowed the company to integrate all of its departments, says CEO Marino. But it's also improved quality of life. "Louisville," he says, "is the place where I want to live until I die."